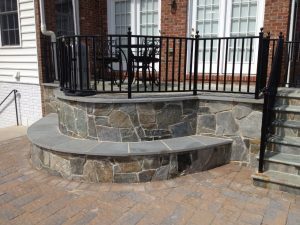 Patios can be made using paver brick or concrete. Typically, a homeowner will utilize a landscape design firm, like VistaPro Landscape & Design, to figure out and then install their patio. In today’s world, where people like to make their home their sanctuary world, more and more homeowners are expanding their outdoor living spaces. They’re adding patios and they like the idea of spending time outdoors, in their own backyard, whenever possible. In some ways, patios are like mini-retreat centers, where people can relax, unwind from the daily stresses of life, and be surrounded by the sounds and beauty of nature, in a comfortable place just a few steps from their kitchen, bathroom and bedrooms. In the past, concrete slabs were the norm for most patios. Or, perhaps, wood decks were “the thing.” Today, many homeowners are choosing to use brick pavers for their backyard patios. People like these pavers because they don’t crack like concrete slabs tend to do, and they don’t require as much maintenance as wooden decks. If you’ve been thinking about having a “paver patio” for your property, consider that other elements can be incorporated into the design for a streamlined, smart look. For instance, planters and seat walls can be added, and they’re both functional as well as aesthetically pleasing to look at everyday. Plus, pavers can look as natural as natural stone, without the high costs associated with natural stone! You can go for tans or grays or reds or browns– there’s a lot of variety available with pavers. Best of all, if you do choose to update your patio with a fresh look, know this: you’re likely to see a 100% return on your investment if you go to sell the house. Outdoor spaces are “hot,” and they’re seen as an extension of the house’s indoor living space. Home buyers are on the lookout for homes with outdoor amenities, such as nice patios with outdoor fire pits, kitchens and water features– all of which a company like VistaPro can design and install. Have you heard of the term “staycation?” It’s a vacation at home– and people today love doing staycations when they have the right kind of outdoor space to enjoy– kind of like having their own resort, at home! To learn more about the benefits of building an outdoor, brick paver patio on your property, contact VistaPro today.